Die Werf Restaurant on the Boschendal Estate is situated in the beautifully revamped original cellar of the Manor House. The Boschendal Estate is a well-known institution in the Franschhoek Wine Region. The focus at Die Werf Restaurant is on presenting contemporary farm to table dining using the best of available local, seasonal and ethically sourced ingredients. This is offered in an eclectic environment at Die Werf Restaurant Franschhoek. At Die Werf Restaurant you can expect fragrant fermented breads, slow roasted ribs of brisket sourced from the herd of Angus cattle on the Boschendal farm – or house-smoked meat and fish and accomplished desserts. 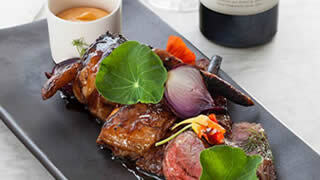 Die Werf Restaurant is fast establishing itself as a foodie hotspot in the Cape Winelands just outside Franschhoek. Our new shared meal experience, crafted by Chef Christiaan Campbell, is a testament to farm to table dining. Share and savour these shared “farm feast” dishes at the beautifully revamped restaurant with views over the food garden towards spectacular mountain vistas. Freshness, authenticity and artistry characterise each plate and our dishes are constantly evolving in rhythm with the seasons. Our daily menu is small and seasonal. What we offer depends on the daily harvest and creativity of our chefs. A sample menu below gives an indication of what to expect at Die Werf Restaurant on the Boschendal Estate near Franschhoek.